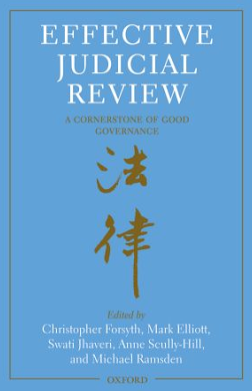 Co-edited by Christopher Forsyth, Mark Elliott, Swati Jhaveri, Anne Scully-Hill and Michael Ramsden, Effective Judicial Review: A Cornerstone of Good Governance was published by Oxford University Press in 2010. The book grew out of a major international conference held in Hong Kong in 2008, which was jointly organised by the University of Cambridge's Centre for Public Law and the Chinese University of Hong Kong's Faculty of Law. The book is divided into five principal parts. The first, concerning the legitimacy and constitutional foundations of judicial review, includes chapters by Martin Loughlin, Paul Craig, Cheryl Saunders and Cora Hoexter. The second part of the book examines the scope and functions of administrative justice, with contributions by Carol Harlow, Paul Rishworth, Janet McLean, Peter Cane, Sir Robert Carnwath and Jeffrey Lubbers. The third part is concerned with necessary preconditions for effective judicial review; it includes chapters by Mr Justice Bokhary, Shimon Shetreet, Lord Brown and Anthony Neoh. The fourth part examines the grounds of judicial review, with chapters by Christopher Forsyth, Emma Dring, Mark Elliott, Jaime Arancibia, Mark Walters and Kevin Stack. The final substantive part of the book is concerned with administrative law in the Hong Kong Special Administrative Region and China. It includes chapters by Benedict Lai, Johannes Chan, He Haibo, Richard Gordon, Mr Justice Ma, and Mark Daly. Sir David Williams and Sir John Laws are the authors of the book's two concluding chapters.